Baby it's cold outside. And snowy, too! An experienced, older girlcat, who knows all about how to give the very best cuddles? "Hello future family! My name is Tiger, and I am that rare red-and-white ticked tuxedo female kitty. Not very many orange kitties are girls, you know. Thank you so much for taking time to read little more about me. I'm a very social, mellow, affectionate girl. I'm also a front declawed lady (in case you live in apartments that demand such things). I may be a bit more mature than some kitties, but I have a lot of love to give! I came here to Wayside because my previous person who loved me so much came down with some health issues, and she made the bravest, most kind decision to bring me here so I can find a new forever home. I have enjoyed my time here at Wayside, but I am ready for my next new adventure, and I am so hopeful that will be with you! Even though I do enjoy some time to myself on occasion, I love getting - and giving - attention even more. I will be a steady companion that will always have your back! I would be honored if you would come down so you can meet me. I'm sad.... Her owner must have really loved her so much... And she's a senior... I bet she's spent so many many years with her old owner. I hope Tiger gets adopted soon... I mean I bet she'll be adopted soon. Fingers crossed. We hope TIger finds the home she deserves. Paws crossed. Äiti says that gadget is indeed a fitbit flex, it is wonderful and helpful, and she also uses a Polar Loop as it proves she has a heart beat. She is a gadget nerd. And we hope Faraday has stopped his experiments- trying to find g by pushing Maxwell. What a goon. Ms Tiger looks so relax and calm. We're purring for her to be adopted soon! Tiger looks like such a sweet girl! 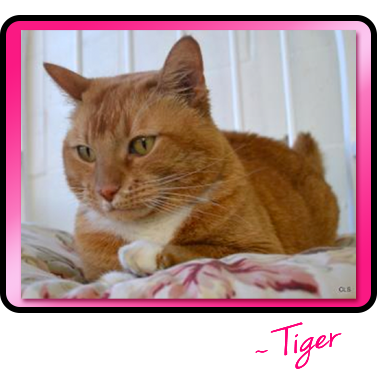 We too hope sweet Tiger gets a new forever home soon. So sad with the seniors. Good luck. Have a wonderful Wednesday. You would never know Tiger is 12 yrs old. She looks very young, and is so sweet. She was recently moved to the room with the Kitty Cam, so you can see her there at www.waysidewaifs.org click on available cats, and then click on kitty cam at the top right corner. OMC - M said she just LOVES tiger. She's so cute. We hope she finds a good home soon. Purrs for Ms Tiger to find her forever home and so unique.